Edge-effect is a permaculture term used to describe how an object can yield more than two purposes. 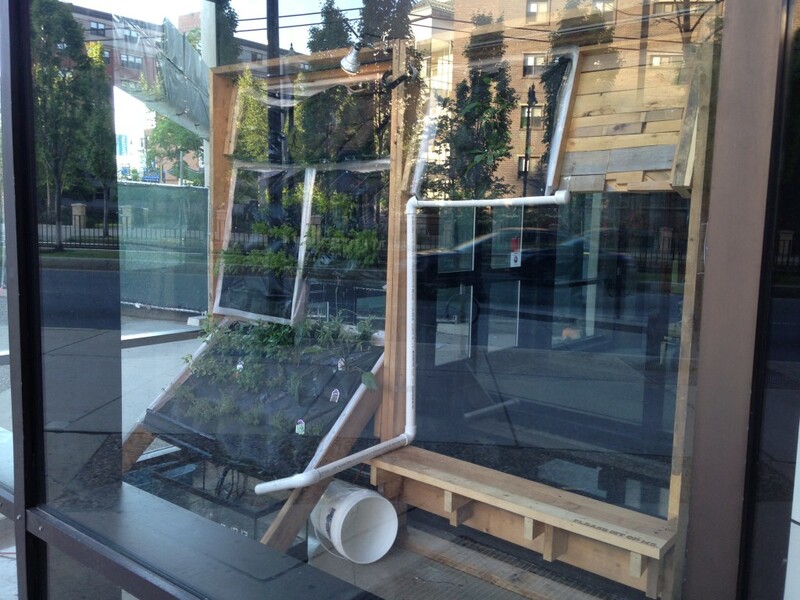 For the spring semester of 2014 I was one of the students to receive the Sustainability Initiative Grant to pursue my proposed project.Throughout the semester I will be continuously adding and harvesting the herbs and vegetables to produce products for the MassArt community. Some of the products include tea for the flu season, tinctures for spring allergies and herbs for some liver detoxing. In addition to the living elements of the wall the divided sections of its Fibonacci sequence will incorporate art installations and interactive pieces. 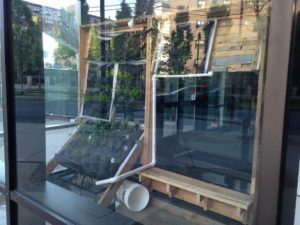 This living wall will provide new platforms for showcasing artworks, locally grown medicinal goods, a public display of MassArt’s sustainability initiatives and an oasis of green before during the greyest of months. This semester i’ve been learning a lot about our pollinator populations and the scary fact that they won’t be here for much longer if we continue our current practices. They’re being effected by a number of things- GMO’s, BT toxins, pesticides, insecticides, and disease. It’s hard for a small person like me to fight against a big company like Monsanto that creates chemicals that are bad for our pollinators. The least I can do is help educate people about what is going on and why it’s so important to halt what’s happening. We’re all aware of the bee and monarch population dwindling, but most people don’t understand the full effect this will have on us. If our pollinators disappear, we lose 35% of our crops. We already have such a hard time feeding everyone in the world and we need all the help from pollinators as we can get. Einstein once said that if bees were to go extinct, we would go extinct four years later. The bee population is decreasing rapidly and we aren’t equipped to handle a world without them. One thing we can do as individuals is become gardeners and plant as many pollinator plants as possible. We can create small pollinator habitats to help population growth. A few of my favorite flowering plants are bee balm, fennel, butterfly bush, and lavender. I’m focusing on the bee balm for my evening wear project. Bee balm is very easy to grow, it has a gorgeous hue, and it serves a variety of pollinators. For my second project i’ll be using lavender as my inspiration. It’s a bright and aerobatic plant. These plants are also a benefit to us – they can be used as essential oils, herbs, and for tea. Lavender is also a natural anxiety reducer for humans. If it can help humans, it’s possible it could be beneficial to bees. They face large amounts of anxiety when they are trucked around the country. Lavender may be able to help reduce their stress. For my third project i’ll be focusing on the white coneflower which hold antidepression medicinal qualities and are extremely easy to grow. 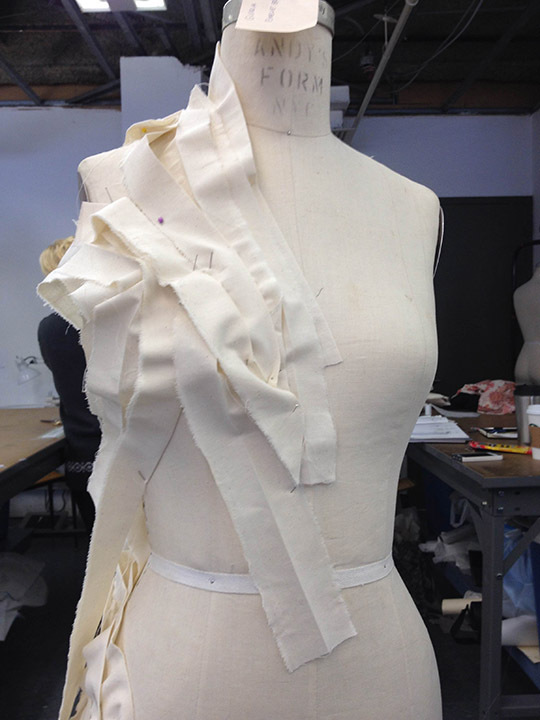 Evening wear is in the process of being made. I purchased ahimsa silk which is harm-free, organic, and undyed. It’s important to me to use this fabric because i don’t think that animals should have to hurt for my work. This fabric is also ethically made. I will be dyeing the fabric with brazil wood to turn it a rich maroon color to mimic the bee balm. I will be silk screening with natural dyes to create a dark motif around the midriff of the dress. This dress will be the most formal and time consuming. It will be the showcase piece and lead the way for the other two garments. I plan to focus a lot on pattern for the next two garments. My next step is finalizing the actual patterns. I’m also thinking of ways i can communicate my message through garments tags. For the lavender i’ve been playing with the idea of making the tag similar to a tea bag but holding dried lavender so as you wear the garment it has a calming effect. I will also be using my work as a process of healing. I have a lot of anxiety and can relate to the bees and I think this work will help me battle the issues i’m having while I help pollinators as well.